You wouldn’t imagine from its almost monastic architecture, that this beautiful boutique hotel was resurrected from the remains of a Victorian ship building yard just under seventeen years ago. 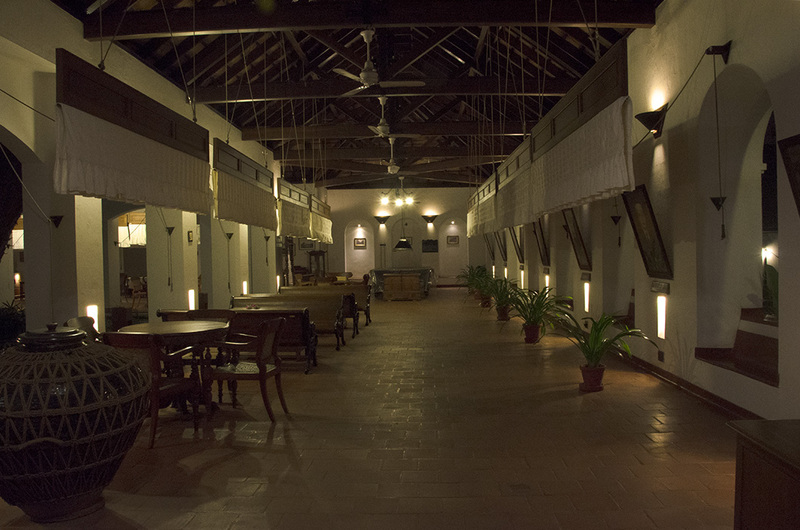 A resurrection that appears to have taken pains to recreate the Portuguese/ Dutch Colonial vibe so intrinsic to Fort Cochin. Ironically, my daughter and I, here on a long overdue girls only getaway last month – a belated birthday gift from me – struggled to connect with that vibe outside of these walls. For precious little of the architectural heritage of this famed port city, once the hub of the spice trade that launched the voyages of discovery, has survived mass tourism and general apathy. 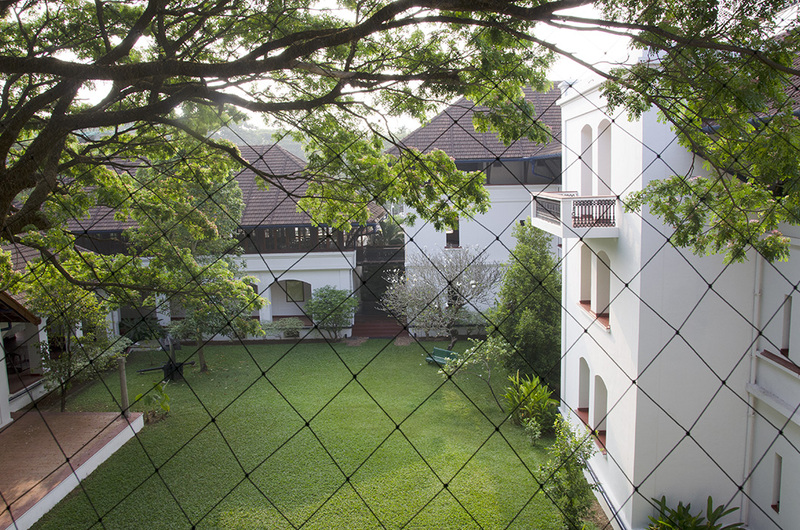 Brunton Boatyard is the only one of the handful of luxury properties in Fort Kochi to boast a prime waterfront location with grand views over the harbour, separated only by a beautiful pool and private jetty. The main door faces inland. A large sunlit internal courtyard is bordered by shady walkways that seem to me to replicate the feel of a medieval European cloister. The arcaded verandahs lead to dining and living spaces spread over four levels. The foremost verandah serves as the reception and lobby, its stark, period re-interpretation, setting the mood for the rest of the property. 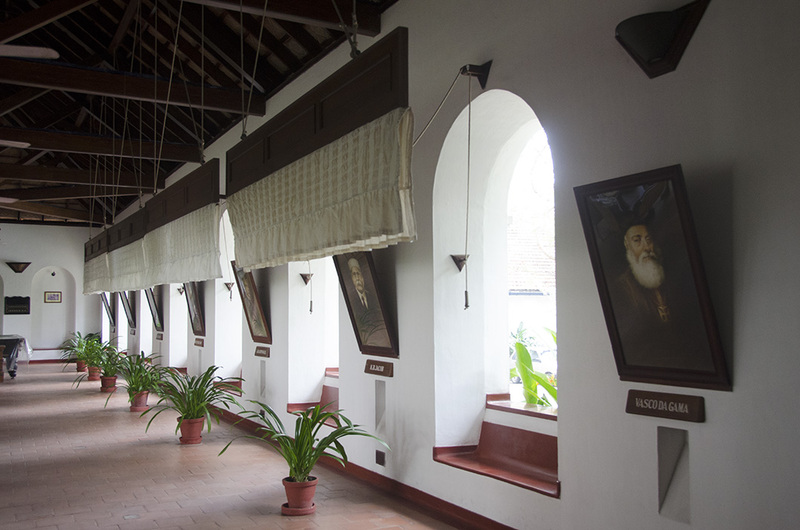 Narrow arched openings on the outer wall are punctuated by rows of sepia portraits* of nearly every individual connected with the early history of Cochin. Rows of punkahs – indigenous hand operated ‘fans’ – above, underscore the Indo-Colonial theme. While the gold bordered pristine white saris of female staff create an elegant bridge to the traditional Kerala aesthetic. My urban heart sank at the sight of all those open, non air-conditioned spaces! But cross ventilation afforded by the open plan design and the strategically suspended vintage fans, ensured we remained cool even while the rest of the city wilted under the mugginess of early summer. 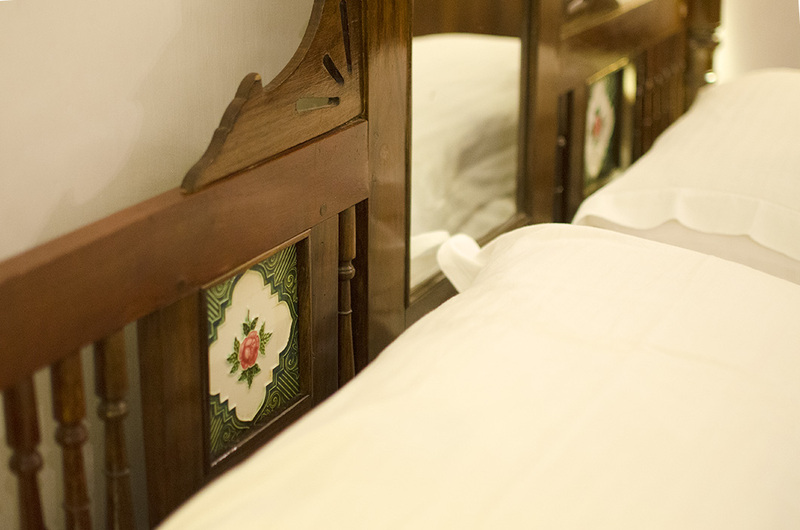 The spacious rooms, with high antique beds (that need steps to climb on!) and wooden armoires, were of course, fully air conditioned. 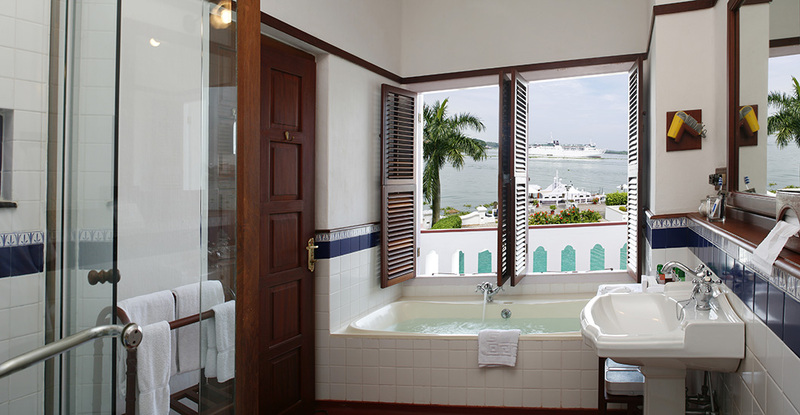 Our last minute reservation failed to garner us a sea facing room, so we missed the luxury of panoramic harbour views, not just from our windows and tiny terrace, but from our bathtub as well! The complimentary sunset cruise that departs from the jetty for an hour long round of the harbour every evening, made up for it somewhat. 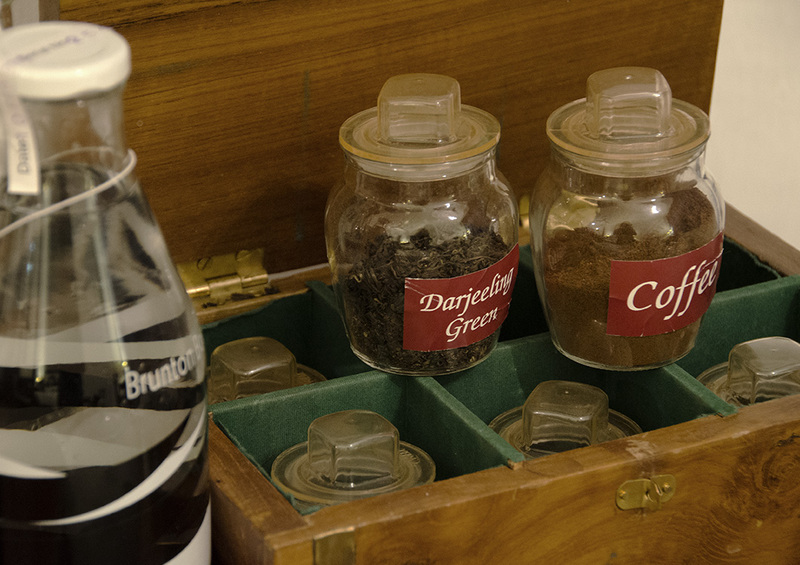 It was evident from the variety of tea leaves and ground coffee on offer in-room, in lieu of the standard tea bags and instant coffee sachets in most hotels, that the people at Brunton Boatyard adhere to the core values of eco conservation and resource management that their parent company – CGH Earth Group* – is based on. Most impressive was the complimentary water in pretty re-usable glass bottles, that had been sterilised and date stamped in their conspicuously located rain water purifying plant in the ground floor! My daughter, who is even more of a ‘Google Rani’ (her name for me!) than I am, had come armed with a long list of places to eat in Kochi. The restaurants at the ‘Boatyard’, however, trumped all those from her list that we did end up trying. Varied, set breakfasts were served in the airy Armoury: the coffee shop in the ground floor, opening out into the harbour front. There was the option of waterside dining at breakfast, as well as for romantic celebratory dinners. History – the fine dining restaurant on the third floor – specialises in authentic Anglo Asian food, its menu drawing inspiration from the cuisines of some thirty odd communities that constituted the melting pot that was Colonial Cochin. Anglo Indian cutlets (we tried the duck) and First Class Railway Mutton Curry, Arabian Samak Bil Harder Asfu (grilled fish), Syrian Christian fish Moilee (a curied stew with coconut milk), Portuguese Vindaloo and Dutch pudding were some of the highlights. Cooled down in this instance with spiced ice cream. 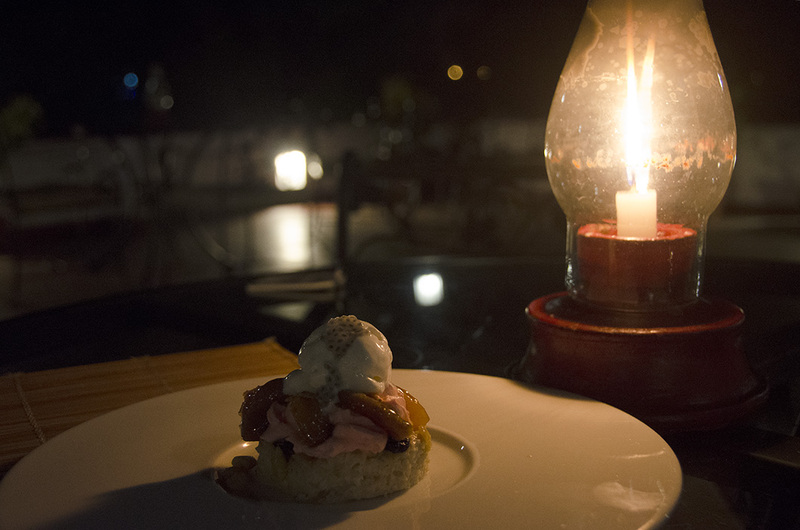 But it is the ambience of the open air rooftop Terrace Grill, with its exquisite seafood ‘experiences’, paired with a chilled crisp white and served to the background score of fog horns, that won us over completely. We vowed not to wait for milestones to celebrate more such birthdays. 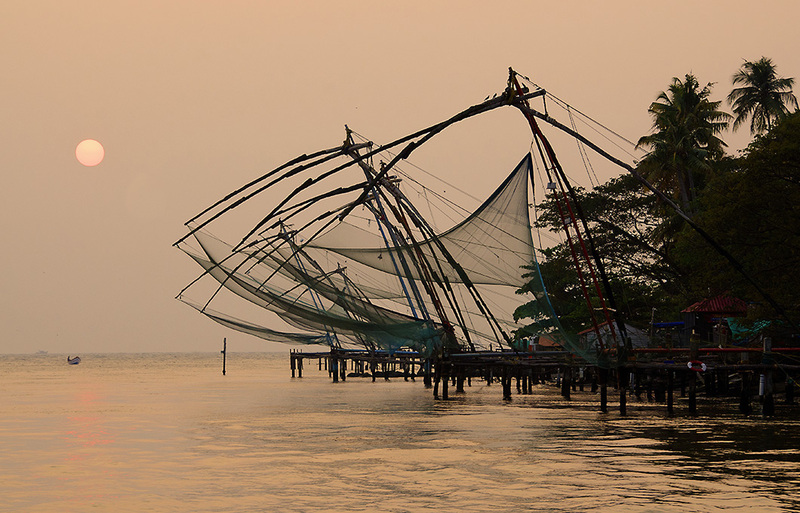 The iconic Chinese fishing nets of Cochin, best photographed from the cruise. Disclaimer: Our two night stay was generously discounted by CGH Earth. *Mr. Brunton is sadly missing from that hall of fame for want of an authenticated portrait. 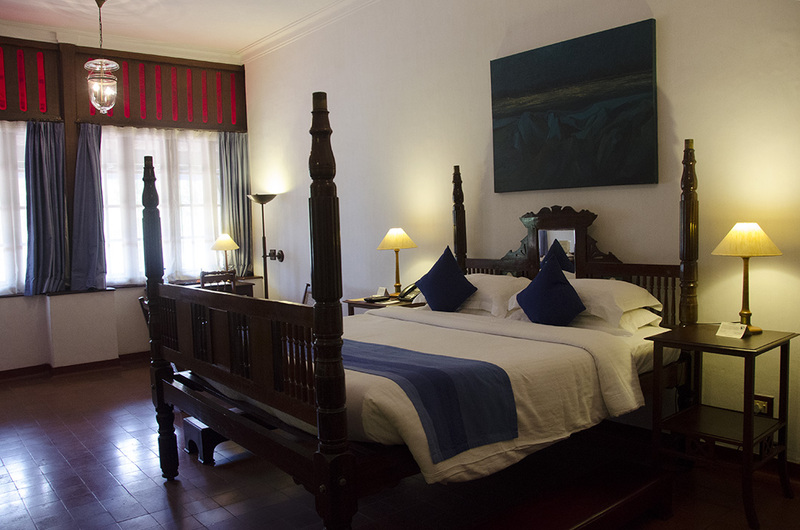 * Visalam, a traditional mansion hotel in Chettinad is also a part of the CGH Earth Group. That moon photo says it all for me. What a way for mother and daughter to celebrate – and I love her name for you. You are a great publicist – if I had a hotel I’d want you to review it because you notice and relish detail. Just up my street, Madhu! Lovely pics too! Thanks Sid. I remember many fun visits with friends as part of the tea industry. This was my first time in Fort Cochin as a tourist. Did you grow up there? First of all, aren’t mother-daughter trips the best?! I love traveling with my husband, hiking groups, and others, but my travels with my daughter are always both relaxing and fun-filled escapes. The place looks very atmospheric – the big, old port building, the breezeways, and that gorgeous scene with the fishing nets. What a nice little getaway! Absolutely Lex! A whole lot easier and fun. We are determined to make this an annual affair 🙂 And yes, the hotel is a gem. .
I’m taken with the beauty of the “iconic” Japanese fishing nets: architectural wonders and utilitarian. Chinese actually! I think they are more attractions now than viable fishing aids, but they do make for some evocative images. Thank you for reading Sally. Have a great day! Wow! Would never have guessed it was once a boat without being told. Not a boat, Mallee, the site used to be a ship building yard. I was impressed by how the architect had managed to make the building look so much older than it is. Sometimes its nice to have a a break from the air conditioning. Brunton looks like a wonderful property for rest and relaxation, and perfect for a girls getaway. Nice to see you, Madhu. I agree, especially considering we managed fine growing up in a tropical coastal town. All old houses were designed to keep temperatures low. But having got used to it, sleeping without ACs would be a hardship in summer. Early March was already terribly humid! Dreading May! 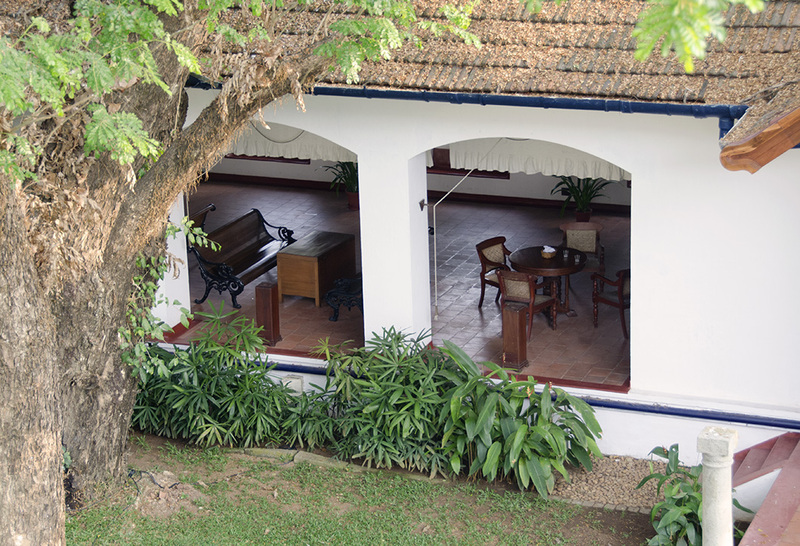 It doesn’t look anything like a boatyard – especially with all those wonderful verandahs throughout! 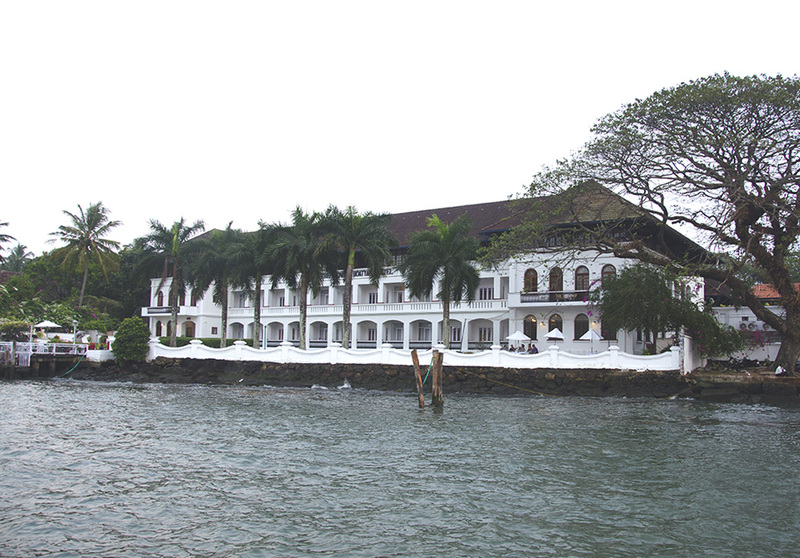 Brunton appears a fitting and well-executed tribute to the Fort Cochin of old. I love all the details: two standouts are the painted map and the coffee/tea box styled like a medicine chest on some 18th or 19th century expedition ship. Given my fascination for spices and the history of the spice trade, I’d be tempted not to leave the confines of the hotel. I too was disappointed by the current state of the town… Fort Cochin still has its churches and some of its pastel-coloured buildings, but I agree that mass tourism and apathy have conspired to ruin the place. The auto rickshaw drivers and shop assistants there were easily the rudest I encountered in all my travels around Asia. This was built from scratch on the site of the boatyard James. Still, it is remarkable how they have created a period flavour down to the little details like the medicine chest. As for Fort Cochin, I was reminded of you and Bama every step of the way. Our auto drivers were actually quite sweet, but attitudes generally ranged from indifferent to surly most everywhere we went outside the Brunton Boatyard. Pity, I remember such good times with friends from the tea industry when we visited from the Nilgiris. One of my Marrakech trips was with my daughter, I’m so glad we did it when we did, by the time she can take off from mummying her littles ones again I’ll be too old. Thank you Gilly. My daughter got caught up in mummying her little ones as well, and it was such a pleasure to have her all to myself for two uninterrupted days. Oh what a beautiful place Madhu. I do hope we get to Kerala one day, to stay at the boatyard, and to see the Chinese fishing boats! I hope you do Alison. I am yet to explore Kerala fully. The backwaters are reputed to be magical. Breath-taking pictures. Feels like in heaven and love your narration. 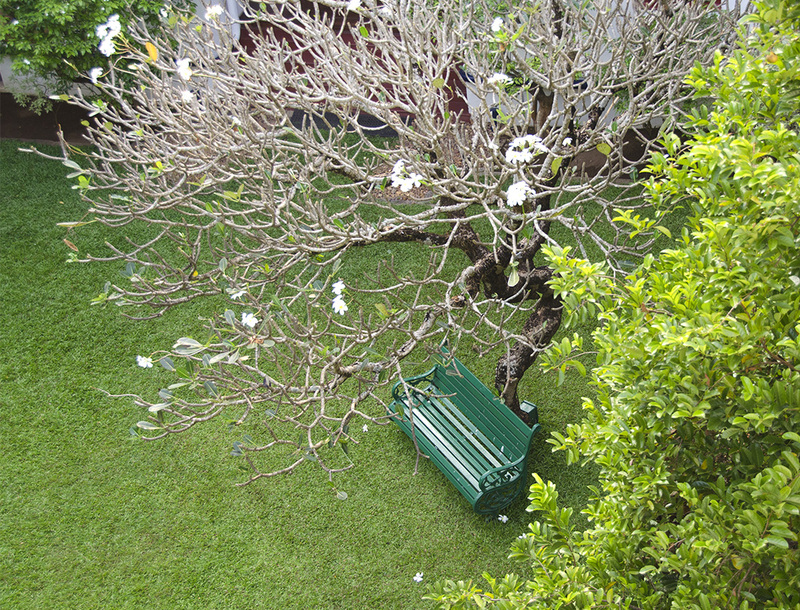 You give an added edge to the place and feels one is already sitting in blissful surrounding. Beautiful place, just perfect to sit back in relax. Nice images Madhu, you know since my recent trip to India , I fell in love with it. Felt as if I was there – well captioned images and engaging narration. Thanks Eric, and welcome back! Have missed you, although my online presence has been erratic as well. Hope all is well with you. Ah, but you know how to live, Madhu! 🙂 Long may you enjoy it. Love the nets! Thank you Jo 🙂 I have to confess those nets look nicer in photographs than in reality! Google Rani! Loved that and will call my wife by that name in future. :). I really enjoyed this blog. Ha, I think Googling requires special skill sets 🙂 Thank you for reading Ian. And apologies for the belated response. How beautiful. The fishing nets and moon, I think I stared at that photo for three minutes straight. I so joyously trip along beside you! 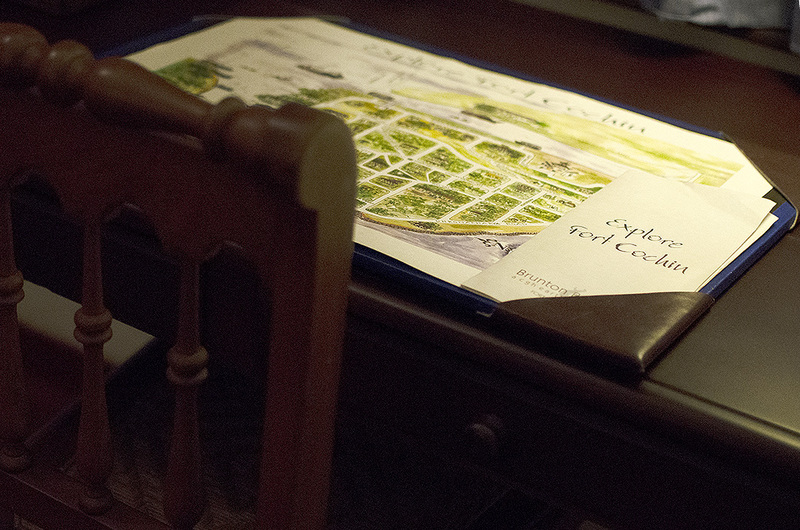 Beautiful writing and pictures! 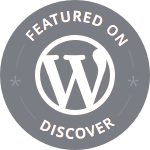 Visiting your blog after long and wondering why I stayed away! 🙂 The place seems like a dream – love that you have to use steps to climb into bed. That bench is calling out to me and that view of the sea from the bathroom is to die for! Sigh! Chaitali, I am touched by your lovely compliments. Thank you very much. Look forward to connecting with you more often. Ha, yes, that’s my daughter’s back handed compliment when she needs help with something 🙂 Our visit was limited to Fort Cochin Kat, I am yet to visit the backwaters. I am going to be concentrating on my interrupted Spain travelogue, and a couple of posts on Tanjavur next. How idyllic Madhu. This place looks magnificent – thank you for sharing your lovely pictures. I gather a lovely time was had by both. I look forward to more posts on this part of the world. What an incredible place, and I think it is the verandah that locks me into the sense of austerity and history of the place…I could live there I believe from what your picture show. Not sure if I’d ever want to fall asleep ~ wonderful writing Madhu. What a lovely adventure to share with your daughter! I had to laugh at the expression “Google Rani.” As always, lovely photos–my favorite is the fishing nets against the orange sky.